School of Forestry and Wildlife Sciences. The compass also helps you continue in the right direction. Your leadership can propel the school in the right direction by helping support the college and current students through such programs as the Dean’s newly founded leadership academy or summer practicum scholarships. Your gift can be divided into workable monthly increments. All gifts are tax deductible, and you will receive a summary of your annual gifts each year. Exclusive perks are given to alumni that give certain amounts each year. Smaller payments that are made more frequently add up to a meaningful gift. Automatic bank drafts are protected and safe. For more information contact the Office of Development at (334) 844-1983 or via email at sfwsdevelopment@auburn.edu. 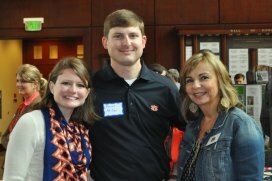 Alumni may also give online to become a member or to renew their gifts by visiting the Compass Circle online giving website.